The veteran Middle East journalist talks to The Global Dispatches about his new book "Beware of Small States". A history of Lebanon and the Middle East, from the end of Ottoman rule to the Hizbullah and Hamas wars of today. 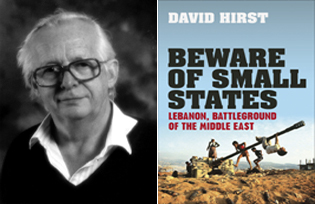 David Hirst, the veteran Middle East journalist speaks to Allston Mitchell of the The Global Dispatches about his new book “Beware of Small States”, published by Faber & Faber. From 1956 to 1963 David Hirst studied at Oxford University and the American University of Beirut. He reported for the Guardian from 1963 to 1997 and has also written for the Christian Science Monitor, the Los Angeles Times, the Washington Times, the Chicago Tribune, the St. Petersburg Times, Newsday, the San Francisco Chronicle, the Irish Times, the Japan Times, South China Morning Post, al-Khaleej [Dubai], al-Ahram Weekly [Cairo] and the Daily Star [Beirut]. He has been kidnapped twice and been banned at various times from visiting six Arab countries, including Egypt, Syria, Saudi Arabia and Iraq. He has published three previous books: Oil and Public Opinion in the Middle East (1966); Sadat (1981) and the classic, The Gun and the Olive Branch (1977 – updated in 1983 and 2003). What inspired you to write your new book and how did the idea for the book take shape? My publisher initially suggested the idea to me, the book was supposed to be a sort of “quickie” about the Hizbullah-Israel war of 2006, to be published about 5 or 6 months later. Once I started writing I realised that this wasn’t really my thing and that I wanted to do something more historical. 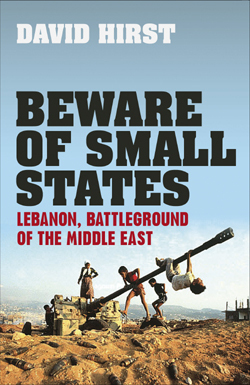 “Beware of Small States” is an interesting title – what does it refer to? I searched high and low for this quote, which I vaguely remembered from somewhere, but had no luck until I looked for it, in French, on the Internet – and lo and behold, there it was – from the Russian anarchist Bakunin,. Once I had found the perfect title for the book – that got me started. You describe in your book how Lebanon has become the theatre for everyone else’s proxy wars. That’s right. It was Bakunin’s point that little states like Latvia and Belgium can become victims of greater states’ machinations – but also sources of trouble for their tormentors. In Latvia’s case it became the theatre for the rivalry between Germany under Bismarck and the Russian empire. This is very similar to Lebanon’s case in the Middle East. Something that I do want to stress, however, is that Lebanon is not a victim of larger states, and arena for their proxy wars, just because it is a small state like Belgium, but because it is also a sectarian state with – in toto – 17 different religious denominations, all of which are represented constitutionally and politically in the Lebanese state institutions. The main denominations also have their counterparts in the larger Arab world: the Sunnis for example have historically identified with Syria; the Maronite Christians have tended to think of themselves almost as honorary Europeans, and more recently we have the phenomenon of Iran supporting the local Shiites, largely through Hizbullah. These outsiders play can “at” Lebanon so to speak, as well as “within” Lebanon, which greatly adds to its vulnerability. Did the book start out as a history of Lebanon and then spill over into a more general book about the Middle East? You will have probably read in the Epilogue that I did not start out to write about the Arab-Israeli conflict, but to a large extent that is what has transpired. It turned into a history of the Arab-Israeli conflict through the lens of one country, Lebanon, where I have lived for 50 years. In the course of writing the book, I realised how important this little country really has been in the affairs of the Middle East. No other Middle Eastern country, except of course Palestine and Israel themselves, has consistently played such an important role in this everlasting conflict. You describe the historical contradiction at the heart of the state of Lebanon, starting with the Druze and Maronites. Their expansion into a ‘greater Lebanon’ was the cause of many of their current problems. Yes, that’s true, but this expansion only relates to the Maronites, who were more numerous than the Druze. However you could say that the Maronites and the Druze, although historically often at each other’s throats, are the “original” Lebanese. Lebanon was initially composed of what we call “the Mountain”, but after the peace treaty at the end of the First World War, it expanded. The areas that were incorporated into this greater Lebanon had historically been part of Syria. The problem was that the new population was largely Sunni, traditionally the ruling class in the Arab world, who were predominant in the newly acquired cities of Sidon, Beirut and Tripoli – they felt they had become second class citizens in this new Maronite-dominated Lebanon. This was the first manifestation of the internal dissension that has marked Lebanese politics over the years, but of course the full story is much more complicated than that. Going back to the Hizbullah question, would you say that they are now a fully-fledged state within a state? As they are being financed by a foreign power is this a sustainable situation? Despite their obvious popularity. Yes, it is a kind of state within a state; however Hizbullah now participates in the national government, something which in the 1980s it refused to do as it regarded the Lebanese state as illegitimate and rotten to the core. Over time they have had to adjust and they now play an active part in the government but all the while retaining elements of being a state within a state, most crucially their military power and all that this implies. Other parties feel that this power gives the Shia community an unfair advantage in the everlasting interplay and rivalries in Lebanese politics. Would you say that since the 2006 war Lebanon has been less of a victim and more of an active sovereign state, or is Lebanon still a theatre for proxy wars? I do mention at one point in my book that the leader of Hizbullah, Nasrallah, in his triumphant speech after the 2006 war (which he believed that they had won) said that their “divine victory” had turned Lebanon into one of the “great powers” of the region. That might seem like mere boasting, which to some extent perhaps it is, but there is also an element of truth in it. Hizbullah had made Lebanon a much more influential factor in Middle Eastern affairs. Have the Lebanese defined a shared national identity for themselves, or do the inherent contradictions that were intensified by the Sykes-Picot Agreement make that impossible? Is there a sense of nationhood that is independent of Iran, Syria, Israel, France and the USA? Yes, I believe that there is. And paradoxically I feel that it has been strengthened as a result of the very long civil war, because most Lebanese developed a kind of fellow-feeling growing out of their being the perpetual playthings of outsiders. Unfortunately, this feeling of national identity does not override the internal contradictions which are still very strong. But despite all that, you could say that there is a sense of nationhood. You mentioned an interesting historical episode in your book, the King-Crane Commission set up by Woodrow Wilson, which intended to ask the local inhabitants how they wished to define their own future. In the end the Middle East was handed over to the French and the British to be carved up. Would the Middle East have had a very different future if this commission had gone ahead? I think the future would have been very different. The Arabs did not want to be ruled by colonial powers, even ones ostensibly operating under the auspices of a League of Nations mandate. They still live with the consequences of that original denial of self-determination and independence and the carve-up of the region at the hands of Britain and France which it entailed. The more important factor is that if the King-Crane recommendations had been followed, there would have been no Israel. King-Crane stated that the implementation of the Zionist project under the auspices of the Balfour Declaration would constitute a ‘gross violation’ of the indigenous people’s rights. Just about all of the problems that we are dealing with today can be traced back to this post-World War One Middle East settlement.. Your book highlights the difficulty of making presumptions about loyalties which seem to be forever changing in the most startling manner. The most obvious one you mention in your book being when the Syrians chose to support the Maronites rather than the Palestinians in 1976, something which confused everyone. All this interventionist action by outsiders is highly pragmatic and opportunistic, but this is all part of the everlasting interplay between different communities in Lebanon. The renowned American Lebanese journalist, Michael Young, put it very succinctly: he called it the “dizzying duplicity of Lebanese politics”. The ever-shifting alliances in Lebanon are very striking indeed. Former enemies could become temporary allies. The Phalangists perpetrated the most notorious atrocity of the civil war, the Israeli-encouraged massacres of Sabra and Shatila; but not long afterward the point was reached where they surreptitiously helped the Palestinians in those two camps against those who had become common enemies of them both. On the subject of the Middle East in general, it appears that the new regional player is Iran, with Egypt, Jordan and Syria being to some extent domesticated. Iran seems to loom large over the Middle East. Indeed, that has been evolving since the Iranian revolution in 1979. In my book I liken the role of Iran today to the role of Egypt under President Nasser when it was the great power in the region. Iran is playing that role now but the big difference is that Iranians are not Arabs. Is the dominant story in the Middle East now the search for nuclear dominance between Israel and Iran or is the Israeli-Palestinian story the main narrative? They are both contemporary issues. The Americans are arguing quite rightly, or at least Obama is, that Iran is profiting enormously from the Israeli-Palestinian conflict and is using that conflict to increase its influence in the region. Obama argues that we cannot deal with the Iranian question independently of the Israeli-Palestinian question. Both questions have to be seen together and Israel has to play its part, he feels. They have to give up their settlements on the West Bank, which by their existence negate the very idea of a Palestinian state. Is Israel still a strategic asset for the USA or has it become a liability? I have always thought that Israel could not be called a close and useful ally of the USA. Historically Israel has been a liability and is becoming more and more so. But too many Congressmen do not see it that way and are quite unable appreciate the obvious. At the end of your book you say that the Obama administration started off by setting a new tone, but very quickly fell back into the old ways of the Bush and Clinton administrations. Yes, but even while I was writing that, I was fairly sure that we could expect further developments. Obama has indeed brought something new to the table but everything depends on whether he is able to follow it up. Is the two state solution that has been under discussion for years, still a viable solution? This solution is impossible given the current number of Israeli settlements. The way things stand territorially a two state solution is unworkable. Such a solution would have to involve Israeli withdrawal from their settlements. How do you interpret the so called “slap in the face” to Vice President Joe Biden relating to the announcement of new Israeli housing in east Jerusalem during his visit? It may have been just a slip-up but the important point is that it reveals a more fundamental issue that was not being addressed. Either way the signals showed that the US administration was incandescent with rage. We will have to see what happens. Is this just a tiff or indicative of a real tipping point? We don’t know the answer yet. Israel is behaving wildly, in its own way not unlike the rogue states identified by George Bush: South Korea and Iran.. If there was a significant political change in Iran and the 150 million dollars a year coming to Hizbullah dried up, would that significantly effect the balance of power in the Middle East? It is probably much more than 150 million. Yes, that would indeed be a blow to Hizbullah, but it would not destroy them. They have their own raison d’être now. They are integrated into Lebanese national politics.